My Dogs Love Me: Happy New Year, Everyone! We would like to greet everyone a Happy New Year! May we all have a great year ahead of us. Wishing you all a very Happy New Year. We hope there are plenty of good things lying ahead for you in 2014. Have a terrific Tuesday and a a great night tonight. Here's hoping you have a wonderful year, too. NO hurricanes! Happy New Year! wishing you all the best for 2014! Happy New Year! Hope you have the best one yet! Happy New Year, Haopee! Thank you for being our friend! We hope your 2014 is filled with an abundance of joy, laughter and love. My Humans and I wish y'all only the best for 2014 and beyond! Happiest of everything to you in 2014! Happy New Year to all of you from TJ, Lizzy Tank and Faith!!! 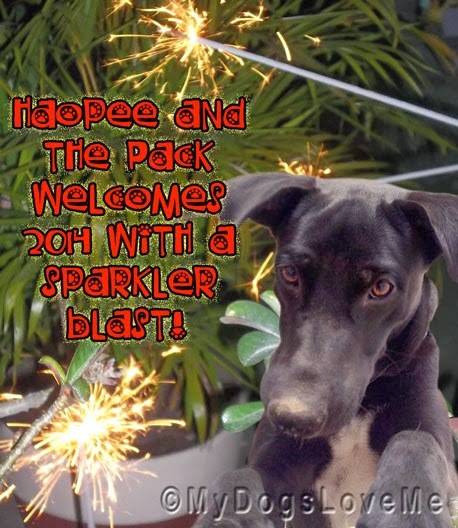 Happy New Year Haopee :) Sorry I'm a bit late, but not been able to get around the blogs as I would have liked! !